The Cricket Loom is compact, capable, and cute! It’s available in a 10″ or 15″ weaving widths. The Cricket is made of high-quality maple ply and hard maple and is left unfinished. Each Cricket comes with an 8-dent reed (sorry, no substitutions). We also have 5-, 10- and 12-dent reeds. Included are a threading hook, warping peg, table clamps, two shuttles, and two balls of yarn. At only 13″ x 18″ x 6″ and just under four pounds, it’s easy to take along. 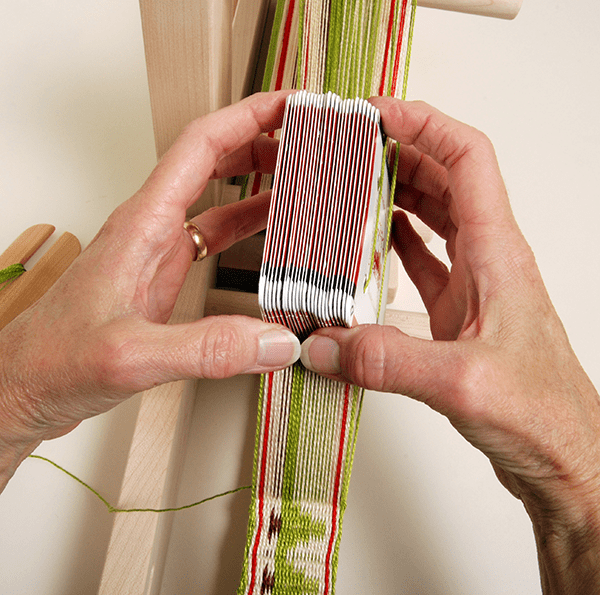 The 10″ weaving width gives plenty of room to make a variety of projects without sacrificing portability. It’s an ideal size for a new weaver of any age. As of April 2010, the Cricket has been redesigned with the ratchet gear and dog on the outside of the loom to make it even easier to adjust tension. Additional shuttles and pick-up sticks are available. The wider weaving width offers more flexibility in your choice of weaving projects, and this Cricket remains portable. Uses the same reeds as the 15″ Flip folding rigid heddle loom. Additional shuttles and pick-up sticks are available.